Thursday and Friday in Buenos Aires were just as busy and today, Saturday, we are off on another adventure. Our Spanish lessons continue - and continue to remind me of everything I have forgotten. Clearly we need longer, but a little is better than none and it will inspire me to continue when we return to Oz. On Thursday evening's event was Nuevo Chique in San Jose. 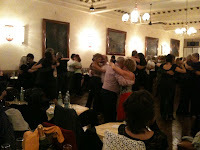 Very popular and very warm friendly - and our evening was made special because tonight I met TangoCherie! 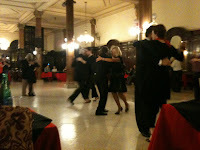 Any followers of this blog will know that Cherie also has a tango blog - and she writes about Buenos Aires. We had promised each other that we would get together in BA and tonight we did. It was like meeting an old friend - and we had a fabulous night of dancing, talking and drinking champers!! Nuevo Chique also has the best DJ (in BA I am told) and the music was excellent - Golden Age, and some great pieces I haven't heard. The night ended abruptly when the lights went out! And my trusty little torch came into its own. Friday was a working day! Silver Fox and I spent the day checking out hotels in BA... Travel agents do this sort of thing so they know the hotels personally and can choose the right hotel for their clients! (Not something you can do on the internet!) I go along to take photos and notes and today we visited 7 hotels of all types! Then a Spanish lesson - of course. A quick kip and we took ourselves off to Confiteria Ideal to catch up with the rest of the group. It is an easy walk from our accommodation and it an amazing tango icon. 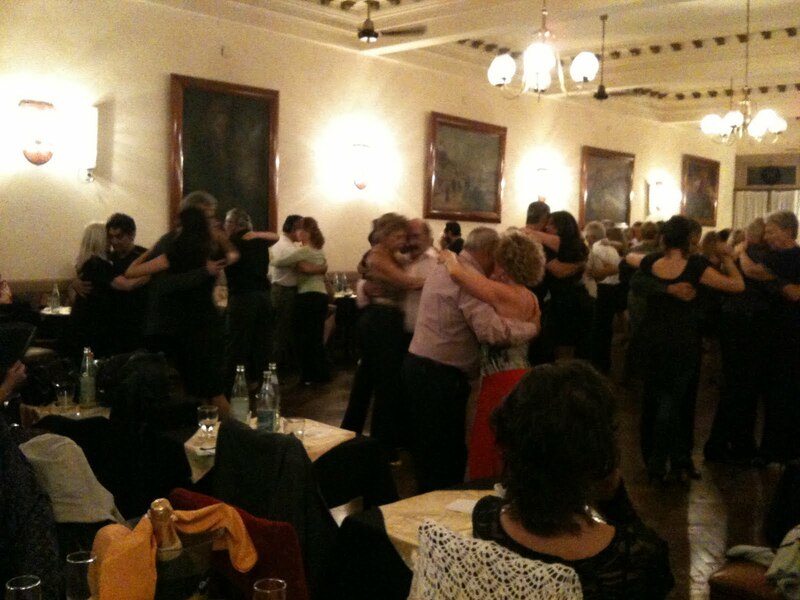 Dancers of all types take advantage of the marble floor - visiting this venue is a must for every visitor to BA. Later in the evening there would be live music but we knew we wouldn't last that long - and we were on our quest to find good food! And we did! Earlier in the day we had been in Reconquista and we spotted a number of restaurants, this was one of them. Al Carbon is now on our favourites list. Excellent pasta - I had ravioli stuffed with salmon and trout - Silver Fox had penne with stir fried vegetables and almonds, a delightful bottle of Rose from Mendoza, and a degustation plate of glace local fruits was a superb way to end another great day in BA.